I have included some of my educational philosophies in the form of I Believe statements. During my placement I came across this poster including I Believe statements from my learners. 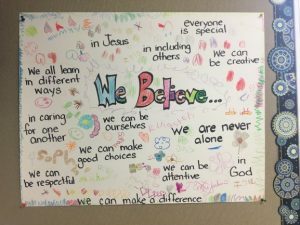 The grade 1s and 2s at St. Augustine Elementary created their own educational philosophies from their learning perspective. I believe in a teacher’s ability to gain control of a classroom. Its okay for a classroom to get out of hand on occasion for a short time, but the ability to gain that control back to continue learning is an important one. I believe some students will not do well on any tests, because their mind just doesn’t work that way. And that is okay! I still believe in testing students on their abilities because it helps the teacher learn. I believe students have a right to learn in a way to get the most out of their learning experience.